TRS is your Norman Roofing Company. With 20 years’ experience, we are experienced in all types of roofing from Residential to Commercial Roofing applications, no job too big. We know that in order to uphold our customer satisfaction, our projects need to be done thoroughly and effectively. Our specialists are trained to deliver a high-grade level of craftsmanship with a very precise attention to detail to ensure the job is done right the first time, every time. In Norman Oklahoma, we offer a variety of both residential and commercial roofing, siding, roof repair, metal roofing, slate roofing products, deck products, windows, doors and contractor services, including whole house custom construction. Do you have a roof that needs to be replaced? 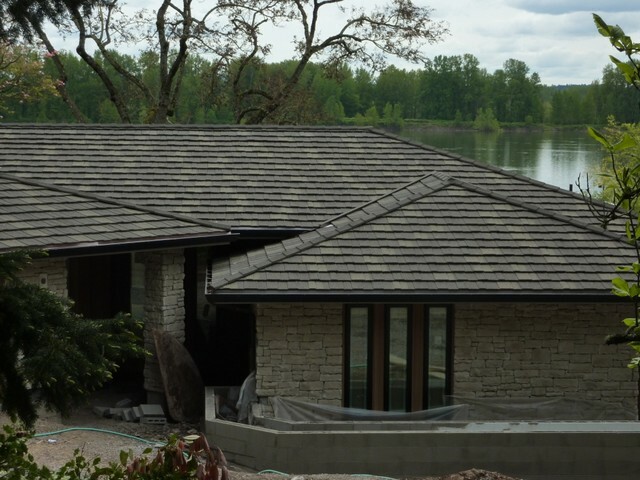 Whether it’s due to a storm or other act of Mother Nature, or just age and wear over many years, TRS Roofing has some of the most skilled and experienced roofers to do the job right. The TRS Roofing team of experienced and trained estimators will responsibly assess your roof conditions and offer appropriate solutions to your problems. Whether you simply need the roof repaired or need a full replacement, we can guide you in the right direction. After a comprehensive inspection, our experts will recommend the best course of action for you, but you are more than welcome to suggest a certain type of material. Our technicians in Norman Oklahoma and the surrounding areas can give you a quote on the cost of the different materials we use. Again, the technician on site will generally give you their best course of action for your unique situation. Asphalt Shingles: Quite possibly the most common type of shingle. This could be for many reasons, but the most popular being because it is the least expensive. Not only is the material the least expensive, but it is also easier to install. Typically these asphalt shingles are made of fiberglass that is impregnated with asphalt, and then surfaced with a sand-like material to prevent cracking and to reflect some sunlight. This type of shingle is expected to last at least 15 years, in some cases up to 25 years. Metal: Aluminum, steel, copper, and more. These roofs are typically installed as shingles, but can sometimes be welded together as a sheet. This type of roofing is extremely durable, but can cost substantially more than traditional asphalt shingle roofs. Cement and Tile: commonly seen as half cylinders. These are more commonly seen on Spanish Colonial or Mission style homes. While this type of material may look classy and sophisticated, it is often very heavy and can put a lot of stress on the structure of your roof. Slate: Slate roofing is incredibly durable, probably the most durable of the bunch. However, due to varying areas of where the slate comes from, it is safe to say that not all slate is created equal. Slate typically will outlast even the fasteners that hold the sections together. It is common to find 100 year old slate being recycled for use on another building; mainly because it is expected last another century without any issues. The biggest downfall to slate roofing is its high cost. It can easily run 10-20 times more than traditional Asphalt Shingles. Call your Norman Oklahoma Roofing company TRS for all your roofing needs.